It's the last of the Marvel movies, so to speak, with the short films that Marvel created to help close some gaps and open the Marvel Cinematic Universe! In this episode, Ben and Daniel crack open the Marvel One Shots! The Consultant, from the Thor Blu-Ray . Our introduction to a couple key SHIELD components! A Funny Thing Happened on the Way to Thor's Hammer, from the Captain America Blu-Ray . 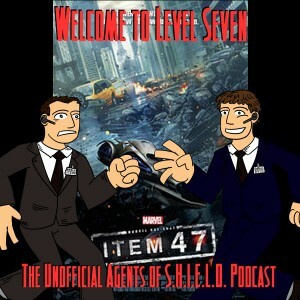 Our introduction to Coulson as an action hero! Item 47, from Avengers Blu-Ray . Our introduction to what an Agents of SHIELD TV show could look like! Agent Carter, from the Iron Man 3 Blu-Ray . Out introduction to a key historical moment in SHIELD's history! What's YOUR favorite? Let us know! Next episode: The Marvel Cinematic Universe comic book tie-ins!